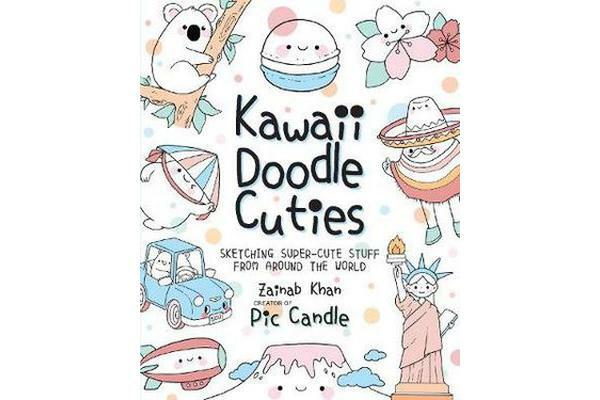 The Japanese word kawaii translates to ‘cute’, and this how-to book is chock-full of super-adorable images from the author’s trip around the world. You will learn to draw cute artwork from every major city of the globe. Every chapter will feature a theme that will guide you along your journey such as nature, animals, fashion, transportation, and more. Kawaii is a popular and easy-to-draw art style beloved by millions around the globe. 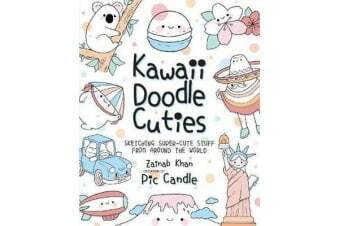 Author Zainab Khan, creator of Pic Candle, has organized Kawaii Doodle Cuties: around the World city by city. This innovative approach to drawing will show you how to draw cuties from each location. In Paris, for example, you will learn how to draw a cute Eiffel Tower and kawaii macarons. You will master how to draw natural wonders like Mount Kilimanjaro in Africa, monuments like the Taj Mahal in India, and transportation vehicles like the Vintage Car in Cuba.The simple, step-by-step illustrations and instructions make drawing these characters easy and interesting. Thanks to this adorable crash course in doodling all things kawaii, you’ll soon be enhancing your notebooks, stationery, artwork, and anything else you can put a marker to with unbelievable cuteness.